Okay, so I've had a bit too much BBQ lately. 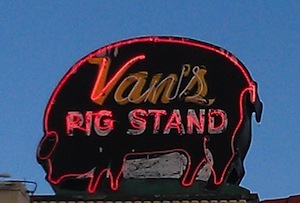 A few weeks back I was up in Arlington and partook of the sacred pig. That's wasn't too out of hand. So, anyway, here are some reviews, if you're ever near one of these places. They're listed in chronological order. Rocklands' take on BBQ is a little weird. It's a bit like my mother-in-law's pork chops. When she makes pork chops, she braises them in a tomato-based sauce. They're quite nummy, but not what I think of when I think of pork chops. The ribs here are similar. They're tasty, but almost seem braised, which makes them quite juicy and tender. The sauce is more tomatoey than BBQey. They're also huge. I was almost thinking they were beef ribs for a second. 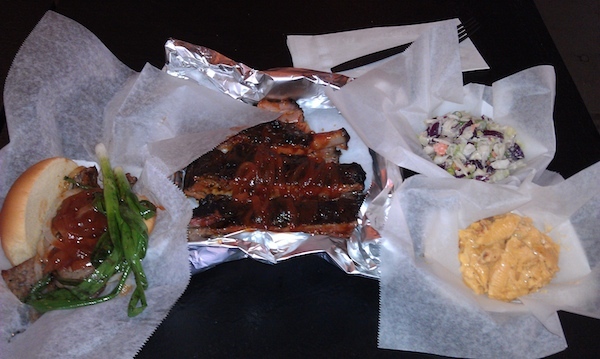 So, overall, I liked them, although they didn't really seem like BBQ ribs. There's a sausage sandwich off to the left. It was fine, but just a grilled Italian sausage. The sides were raved about in online reviews. I'm not sure why. The mac-and-cheese was thick and a little gloppy, not creamy at all. The cole slaw was more like midwest macaroni salad, only with cabbage instead of macaroni. Tasty stuff, but not exactly cole slaw. The bottom line? Good tasting food but not at all like the BBQ you might be expecting. I'd probably enjoy it again, with my expectations scaled appropriately. Oh, they also had a wall full of various sauces, mostly hot sauces based on a quick glance. 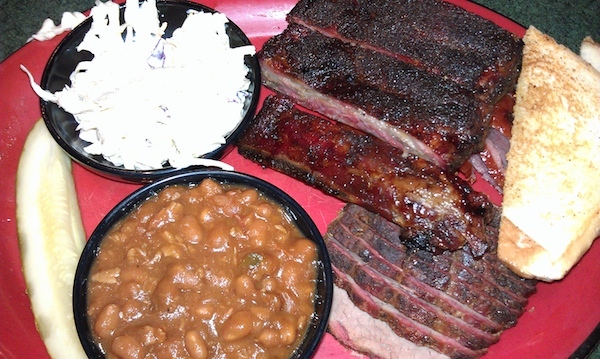 But the ribs themselves were so saucy that additions would have likely been lost anyway. And then I was off to Oklahoma! 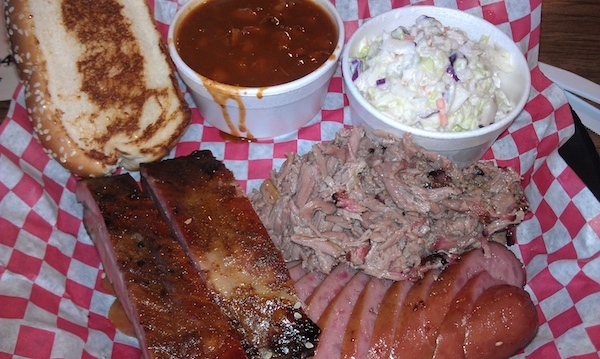 The Rib Crib is one of those mid-level BBQ chains. It has its share of faux ambiance, more Smokey Bones than Famous Dave's. Nothing offensive, but nothing authentic. The BBQ was a toss-up. The ribs were fine. Nothing spectacular, but not bad, either. Just fine. Under the piece of toast is a pile of decent smoked sausage. The beans were tasty and the cole slaw was fine, although marred by overly large hunks of cabbage. I don't usually get brisket. Too often, brisket comes out thinkly sliced like lunchmeat, tasting no better. The Crib looked like it cut it a little thicker, so I gave it a shot. Big mistake. It was very dry. I didn't finish it. Like many chains, they had a variety of sauces, including an interesting Carolina-style mustard sauce. Inside, the beautiful smell of hickory smoke is intoxicating. The decor is plain, as it should be. The folks are nice, as they should be. They also have a good selection of sweet T-shirts, already permeated with smoke. It's a shame to wash them, really. The food ain't bad, although it's, well, real white-bread. I don't know how else to put it. Let's start with the ribs, which were mighty good. Meaty, tender but not too tender. There was only one sauce available, a typical sweetish tomato-based one. The sausage was, well, hot-doggy. It was way too mild and lacked smoke flavor. It did pair well with the sauce, but, still... hot-doggy. The chopped pork was also weird. Porky, without being at all smokey. Not as hot-doggy as the sausage, but nothing like I've come to associate with BBQ. Cole slaw was great, crisp and clean tasting. The beans were creamier than most BBQ beans. You can see in the photo how lighter they are. Tasty, but, again, kinda white-bread. 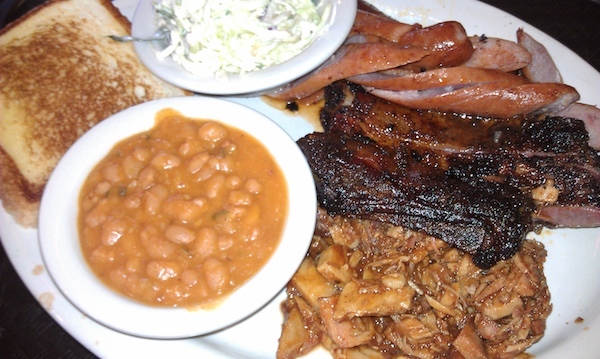 And, finally, we get to Ray's, which was, by far, the best BBQ I've had in quite a while. The decor ain't nuthin' to write home about as the building appears to be an old Pizza Hut. (Or maybe an Embers? I thought those were local to Minnesota, way back when.) But, the food? Oh the food! The ribs were great, a good solid rendition. I was a little put out at first that I only received 2 ribs versus 3 everywhere else, but these were nice big meaty ribs, so I ain't really complaining. The sausage was also good, with more smoke flavor than the other sausages I had in the area. The sausage could stand alone while also paring well with the one sauce available. Now, I arrived not that long before closing and they were out of pork. The cashier suggested brisket. Note that I had already been burned once on the brisket front this trip. I took the chance; I was glad I did! The brisket was chopped-up, juicy and flavorful, with charred bits from the exterior providing both textural and flavor contrast to the tender meat. Honestly, this was a pile of goodness. The sides were fine. The cole slaw was crisp and clean. The beans were a little weird. They were in a cumin-heavy sauce, tasting more like a thin beans-only chili than any sort of BBQed beans. Holy crap. Just now seeing the devastation around Oklahoma City from the tornado. Norman is the next city down from Moore. I hope the folks I met and the BBQ places at which I ate are all okay.